The 10 Best Pizza Restaurants in Missouri! In the mood for some St. Louis-style pizza? How about classic Chicago deep dish? Or maybe a classic pie you’ll only find in Missouri? Whatever you’re craving, you can find it at one of Missouri’s many excellent pizza restaurants. Here are the 10 best! 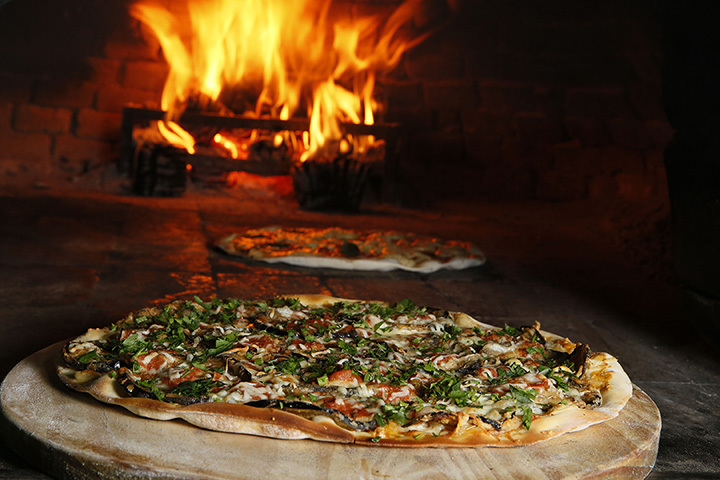 Woody’s offers traditional wood-fired pizzas in a restaurant that will seat about 20 comfortably. Try the Mutha’, the mother of all pizzas: Italian sausage, pork, beef, Canadian bacon, and pepperoni topped with vegetables and a five-cheese blend. Friendly staff and hometown taste. Called the best college eats in the nation by “ABC News” and “Good Morning America,” come in for a great “Shakesperience.” With a large about 16 inches in diameter, toppings that are always fresh and seldom canned, these are pizzas to be eaten with a fork. Great salads, garlic cheese bread, and a wide variety of beers and wine fill out the meal. A Rolla institution, Alex’s offers the same dough and sauce that’s brought in University of Missouri students for over 50 years. Best known for their pizzas, Alex’s also offers pastas, Mediterranean dishes, Gyros, and much, much more. Drop in and see why alumni bring in their children and grandchildren. Bella Napoli has it all: Italian restaurant, deli, coffee shop, even grocery. Since 2001, Bella Napoli has offered only genuine Italian food and merchandise. Pizzas made with homemade Italian sausage, real Provolone and smoked mozzarella, and a unique atmosphere combine to make this one of Kansas City’s best pizza places. A short trip from Branson to Rockaway Beach, and you’ll find yourself at the pizza restaurant favored by all the locals. The high-powered pepperoni is a favorite, with a thick and crispy crust unlike what you’ll find at commercial pizzerias. High-quality food, low prices, and friendly service make for a great time (and the restaurant really is located in a cellar)! Pizza Glen is a family-owned restaurant, established in 1976 and cranking out classic pizzas ever since. The supreme, pepperoni and sausage pizzas get high marks, and the salads are both simple and delicious. A nostalgic family atmosphere and friendly service bring people in from all over the area. In business since 1956, Cusanelli’s is a St. Louis tradition, known far and wide for its St. Louis-style pizza and many Italian dishes. Popular among the many offerings is the Deluxe, featuring homemade sausage, bacon, pepperoni, plenty of cheese, and served on a thin crust. Generations of Missouri natives have grown up going to Cusanelli’s. and the up-and-coming generation gives it as high marks as their parents and grandparents did. Starting his pizza-making career at the family restaurant in north Chicago, Mr. Gilberti and his wife, Susan, have brought the secrets of Chicago-style deep dish to the Ozarks. Locals love everything on the menu, but be sure to try Mama Giberti’s Specialty: Black olives, mushrooms, marinated green peppers, red onion, tomatoes, spinach, and (if you’re up for the challenge) jalapenos. Calgaro’s is known for its unique brick-oven pizzas, including the Buffalo Pie (an order of boneless buffalo wings, chopped up and topped with bleu cheese crumbles and fresh mozzarella) and the Fresh Lobster Pie (lobster, roma tomatoes, sautéed spinach, on their signature white sauce). The historic building in downtown Springfield, coupled with a complete bar, make this a dinner time excursion you won’t want to miss.